Sometimes I get asked why I believe in God. In the past, I used to say that I found it harder to not believe in the existence of God than to believe in His existence. To put this another way, I found it easier to believe that everything came from God than to believe that everything came from nothing. And yet … let’s be honest … saying that “everything came from God” only pushes the logical causality of everything further back one step. If I have trouble believing that everything came from nothing, and so say that everything came from God, the question is then, “Well then, where did God come from?” The Christian answer is that He didn’t come from anything; He just always was. 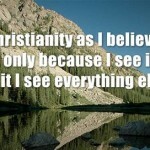 So really, the choice is between believing that everything came from nothing, or believing that God has always existed. Neither choice is easily understood or comprehended by the human mind. However, even with these two options, I still prefer to believe in the existence of God, for at least with God, there is the recognition of a mystery that cannot be understood by human finite minds, whereas without God, the idea that something came from nothing is just pure nonsense. But recently I have come to realize something different. I don’t necessarily believe in God because I can prove the existence of God. No, I believe in God because through this belief, the world makes more sense. Belief in the existence of God is the organizing principle of everything. Without a belief in the existence of God, everything is simply random meaninglessness. But with a belief in the existence of God, many of the dilemmas and confusing things of life suddenly make sense. C. S. Lewis once said something like “I believe in Christianity as I believe that the sun has risen: not only because I see it, but because by it I see everything else.” I mentioned this in my recent podcast on Genesis 1:4. As usual, C. S. Lewis is right on target. Believing in God is like believing in light. While light can be seen, you only really see light itself when it shines directly into your eye, like when someone shines a flashlight into your eye, or when you look at a light bulb or the sun. But you don’t need to have a light shown into your eye to know that a room has light. You know that a room has light because you can see the room. When you look at the walls of a room, and the items that are in the room, you are not seeing light, but are seeing things by the light. When light hits something, it allows you to see that thing. It diffuses, scatters, or reflects. When we look at things and see them, we can know that the light is on them, not because we see the light, but because, by the light we can see. As I have come to see the world through the light of Jesus Christ, the crucified God, this crucivision lens has helped me understand life, Scripture, and theology more clearly, and it has helped me grow in love for others more deeply. So also with the existence of God. Believing in the existence of God helps us see ourselves, other people, this world, and our purpose more clearly. Of course, you have to believe in God as He is revealed in Jesus Christ, or else you may end up believing in a god that acts like Hitler, and seeing the world through that lens will not be helpful for anybody. But that’s a subject for a future time. Do you believe in the existence of God? Why? Do you think that this belief helps you understand life and live your life better than if you didn’t believe in God? Haven’t thought about it like that, but great post! There is not one post or podcast from you that I haven’t learned something – so thanks! I have always found it uncomfortable to think in terms of life being an accident and having no lasting purpose. Belief in a creator is far more comforting. I believe in God, for sure. Being a health student and science nerd, there’s just too much that is in order that HAS to have a higher power behind it! I just don’t think that I believe in a God that everyone else wants me to. I have a much different understanding of who/what He is than what most people believe. I have met several people who don’t believe in a higher power who have come to accept the belief that there is no life after death. For me personally, I don’t see how they do it, but then again, everyone has their own tips and tricks to life. Your spot on when you keep coming back to Jesus and exactly that is what other belief systems are missing. You an only look at God trough the lens of Jesus, just like Jeremy said in this and many other articles he wrote. Doubt everything you know if you keep coming back to Jesus to guide you. I doubted a lot in my life even the divinity of Christ, but it did not keep me form trusting him. He has done so much more than I can ever understand, and the most beautiful thing is, he keeps doing it. Praise to his name. Peace to you in the name of Christ. Thank you for your encouragement Taco, I appreciate it. the love of Christ surpasses all understanding. How true when you say you always keep coming back to the Christ. Its when we keep coming back to the cross we begin grow in the knowledge of the forgiveness that is in Him. This is Holy week, Oh how much we need to pray for the world and peoples hearts would be changed and come to the cross! We all need to pray that these extreme Islamist would come to an end! Pray that A miricle could happen and they would come to an end. Jesus said “He who has believed and and has been baptized shall be saved.” (Mark 16:16) The question remains. Has believed what? The light is shining on this post.